Oh how I love risotto! It’s sooo gooey, cheesy and delicious! The base for a risotto is alway the same: Arborio rice (italian rice) broth, wine and cheese. 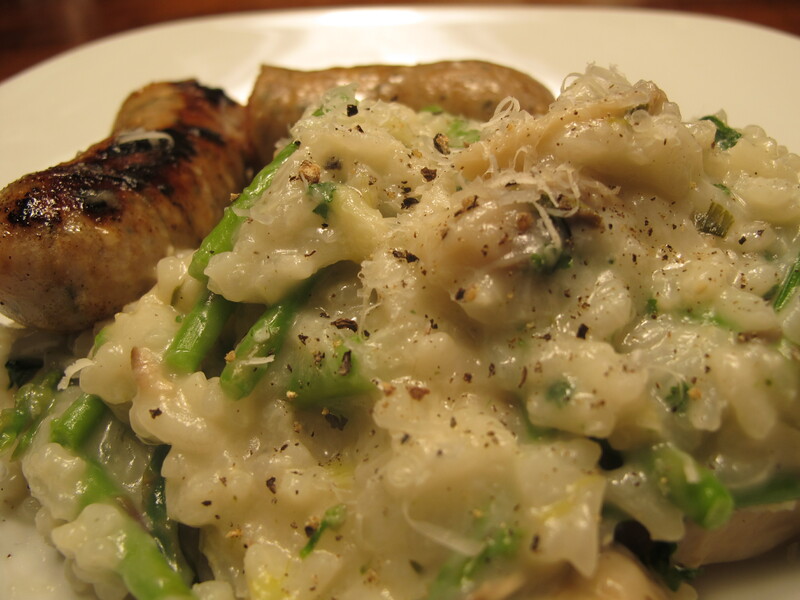 For the rest, you can add any ingredients that you like…mushrooms, asparagus, lemon, sausages or all of the above! The secret: you must give your risotto a lot of love and attention. You must stir it often and slowly incorporate the broth, it’s like a long love affair that you must cater too, devoting all of your time and energy to this piece of perfection… but after 30 minutes, the dish is ready and you will be more than happy to have taken the time to make this succulent recipe! Bring broth to simmer in large saucepan over medium heat. Reduce heat to low; cover to keep warm. Melt 1 1/2 tablespoons butter with oil in heavy large saucepan over medium heat. Add shalots and sauté until tender, about 6 minutes. Add rice; stir 1 minute. Add wine and stir until evaporated, about 30 seconds. Add the herbs and 1 1/2 cups hot broth; simmer until absorbed, stirring frequently. Add the mushrooms, asparagus and the remaining broth 1/2 cup at a time, allowing broth to be absorbed before adding more and stirring frequently until rice is creamy and tender, about 35 minutes. Stir in cheese and remaining 2 tablespoons butter. Stir in parsley, lemon juice, and lemon peel. Season risotto with salt and pepper. Transfer to bowl and serve. Note: you can add broth or put less depending on how cooked the rice is…but usually 5 cups of liquid is plenty!